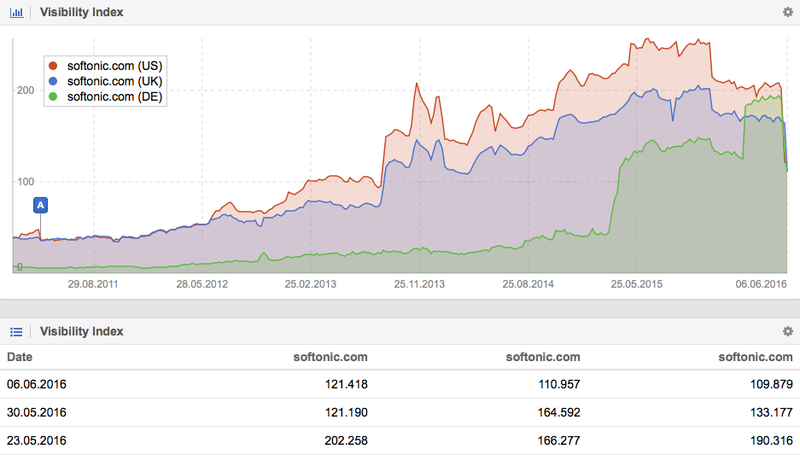 Software and app portal softonic.com has been on the receiving end of a manual action from Google, meaning the site’s visibility has taken a hit. The major loss in visibility is for Softonics’s biggest directory, /s/, which accounts for 40% of the entire domains visibility. The full list is here, but suffice to say it contains many of the site’s most popular downloadable assets. Further investigation by Juan hints at the reason, thin content on category pages. Just to clarify: the action taken was in relation to ‘thin content’ and only affects our search results pages. As you can imagine already we are working to remedy this. Thank you. For example of the issue, Softonic used to rank highly for the term ‘microsoft office’ with this page, a site search results page. As Juan points out, Google has advised on these ‘doorway pages’ which are essentially ‘SERPs within SERPs’. There’s nothing wrong with using category (or hub) pages to help you rank for key terms. Indeed, it’s an essential part of an effective internal linking strategy. Many websites do this effectively, publishers like the Guardian for example, while Mail Online has recently implemented this strategy. It avoids the problem of cannibalisation, whereby pages from the same site or domain compete against each other in the SERPs for the same term. However, when pages are automatically generated like these (eBay had a similar issue back in 2014), then you have the problem of thin content. Using category-pages can be a great idea, which can really help your rankings. You just have to be careful of how you implement this strategy, as Google has been making it plain for years, that it does not want to have search results within their index. At their core, category-pages are often created through internal searches, which list all articles on a website for a specific keyword and this is exactly what may invoke Google’s wrath. For Softonic.com (the category-directory was /s/), the problem was not that it used category pages, but that the content on these pages was created through the 1:1 internal search. In essence, category pages are great, but you need to work harder on the content – curating content for these pages is a way to avoid this problem, but also to add value for your users.